Solar Powered Hummingbird Feeder-SE931. Color changing feeder at night. 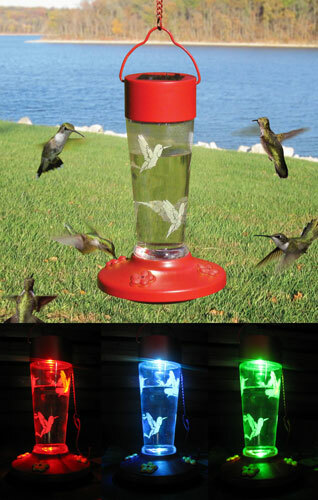 This great looking Solar Lighted Hummingbird Nectar Feeder serves double duty in your backyard or garden. By day, it's a functional 4-port nectar feeder that draws Hummingbirds for your viewing pleasure. By night, the feeder becomes an LED color-changing light show. The solar panel in the top of the lid feeds the rechargeable battery which is included. After dark, it automatically lights up and cycles through 7 colors ranging from red to blue to green in a continuous pattern. The durable weatherproof design features a vivid red base and top and an imprinted glass jar that is dishwasher safe. The gently tapered jar has a flat top and wide mouth that is easy to clean. The bottom of the base is translucent allowing the lighting effect to shine through the bottom of the feeder. Great great customer service. I was missing one item, I notified the company, received an email right back saying it was being taken care of and it was completely corrected with the missing item in my hands within 3 days. Wonderful. I love the feeders. I bought 3, two of which are the solar ones. They are lovely. And the mixer is genius. How did I ever manage this before. It is truly a must have. I'm so glad I found you on the Internet.